What are the dimensions of the pendant? Does FreedomAlert work with Digital and Standard Dial-Up phones? 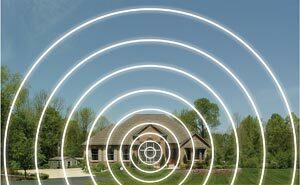 What is the Freedom Alert’s Wireless Range? Can I test the range? What comes with the Freedom Alert? LogicMark is a Virginia based company that specializes in the design and manufacture of innovative Personal Emergency Response Systems. No! The FreedomAlert uses your standard home phone line. Yes, FreedomAlert works with both Digital and Standard phone applications. No! 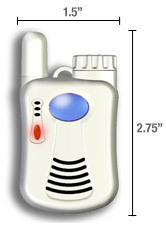 Because the FreedomAlert is the world’s smallest cordless speakerphone, you can speak directly to a Friend, Family member or the 911 operator instantly from anywhere in or around the home. This is the only product that allows you to speak from ANYWHERE in your home, not just within 50 feet of a speakerphone. The pendant range is up to 600 feet in a free-space environment! It will cover typical American home and even a short distance outside your home into your yard. Yes. Simply use the test button on the back of FreedomAlert. Hold the button in for 5 seconds and you will hear a system check. If it says “All systems are OK”, then you are within range of the base unit. You can walk around your home and test this feature at any location to see if it will work from there. Just plug it into your existing phone jack. You will need to program the Friends and Family phone numbers, if you so chose. For the simplest installation you can simply select the “911 Only” mode and your emergency call will go directly to the 911 operator. Yes! The FreedomAlert is completely legal to use in all 50 states and Canada. The product meets the requirements of the FCC and is in compliance with standards set by NENA (the National Emergency Number Association –“911” group). Yes, the FreedomAlert uses special rechargeable Lithium-ion battery. There are 2 batteries included. The battery standby time is 2-3 months and it can be tested at any time by pushing the test button on the pendant. When the battery test shows that the battery is low, you simply replace the battery with the second battery that is charging in the base unit. And just swap the two batteries around every month or two. The FreedomAlert comes with 4 rechargeable batteries that are installed in the base unit. These batteries are constantly being charged while the base is plugged in the wall outlet. When the power fails, the FreedomAlert automatically switches over to these rechargeable batteries which will provide over 12 hours of back-up protection. There is no maintenance needed for these backup batteries. There can be up to 4 Friends’ numbers programmed (though you do not need to program all 4 numbers) and/or 911. The calls are placed in the order that they were programmed in to the unit. If the first person does not answer, the unit hangs up and calls the second number. If they don’t answer, it will call the third etc. 1. Pushing the gray System Test button on the back of the pendant ends the call, hangs up and resets. 2. 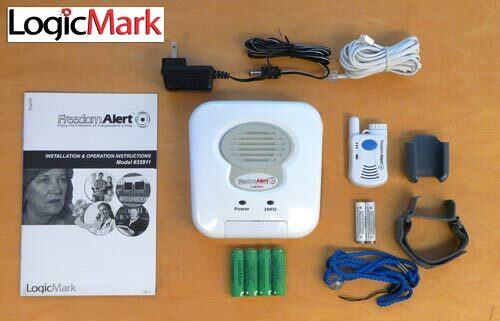 The FreedomAlert should detect the other person has hung up and will automatically hang up in 20 to 30 seconds and reset. 3. If the FreedomAlert pendant detects 60 seconds of silence, it will automatically hang up and reset. All previously programmed Friends’ numbers are erased when a new Friends’ number is programmed. If one of the Friends’ numbers is changed, all of the Friends’ numbers will need to be reprogrammed. Also, if no Friends’ numbers are programmed into the FreedomAlert it will call 911-regardless of the switch setting. Yes, the FreedomAlert can be used in the shower even though we don’t recommend it as a normal practice. Its best to just lay FreedomAlert on the floor just outside the shower area so that it can be reached if needed. The FreedomAlert will not dial correctly when connected to a VOIP modem. Always use the area code with the local number when programming a Friends’ number into the FreedomAlert. Even though you do not need the area code when manually dialing the local number, VOIP systems seem to often require the area code. Your order will ship via USPS the next business day from the date your order is placed and should arrive in 4 to 6 business days.